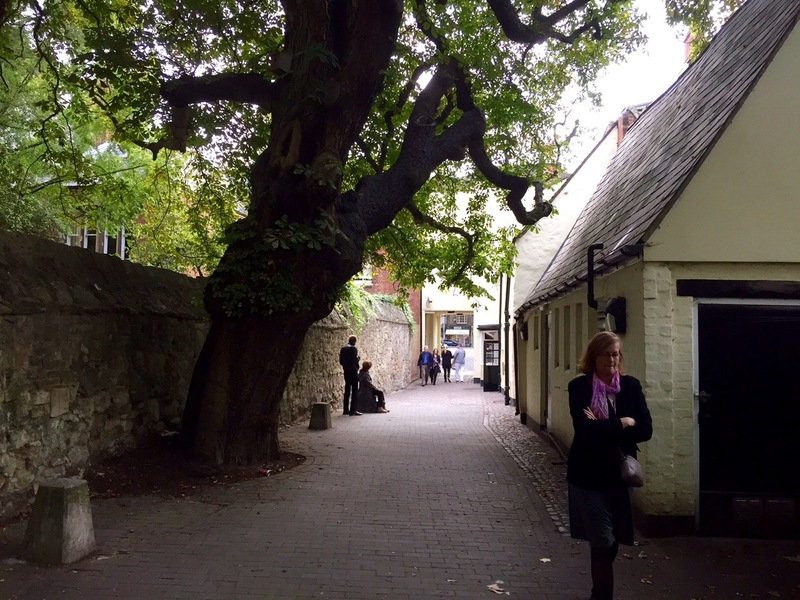 Kathy walking through the Lamb and Flag Passage past a pub of the same name. You’ve probably never heard of Adam Buck. We hadn’t. Hardly anyone has these days, said Lynne, our tour guide at an exhibit of his work at the Ashmolean Museum in Oxford. This is a miniature Adam Buck painted of himself. But in the late 18th and early 19th Centuries, he was very well known. There was a revival of his work about a hundred years later before it sank once again into obscurity. In his day, he fulfilled an important function, one performed today a million times a day by smart phones: the selfie. 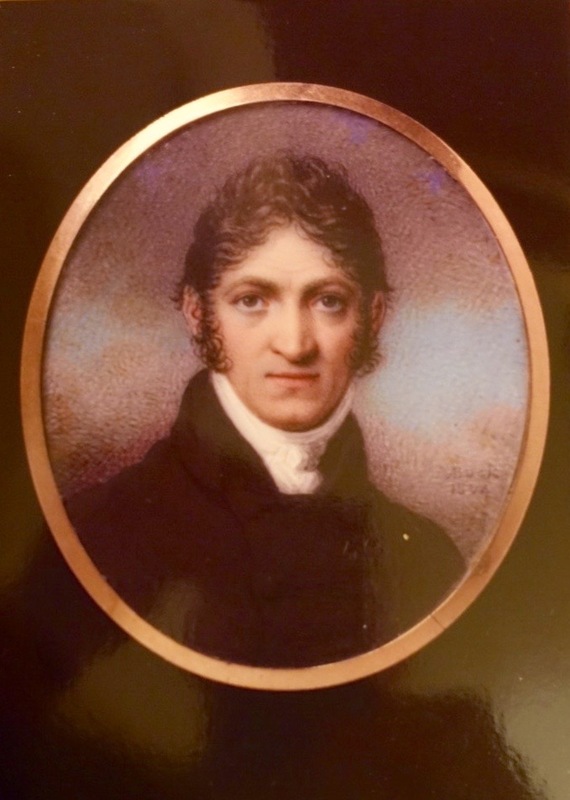 Buck was a master at fine detail and accurately painting the likeness of a person, often on ivory, which could be carried by a loved one who might be sailing off to war or separated in some way from the cherished one. His miniature scenes were also reproduced in prints, on pieces of china, ladies’ fans and on fabric. He was from Cork in Ireland, son of a silversmith. “He was trained, but we don’t know by whom,” our guide said. He was heavily influenced by Greek vase painting and proposed a book on the subject but never found a backer. Often the subjects of his prints were shown in classic Greek poses with flowing gowns. 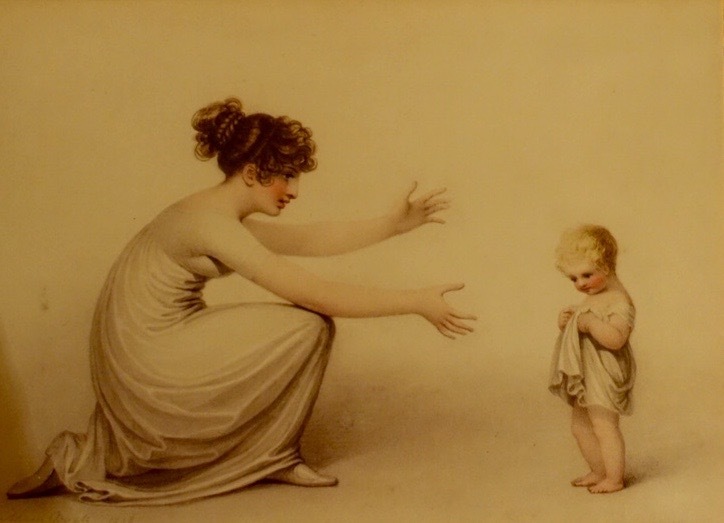 “First Steps in Life,” 1808. A lock of hair was often included in the brooch with his miniatures, especially in ones meant to remember someone who had died. Buck portrayed hair styles very accurately, important in the work he did for the “Vogue” magazine of the day, which guided ladies on what was fashionable. He painted for a number of print makers and also took jobs from the wealthy who wanted portraits of their families. The exhibit included some of the work he did for the Duke of York and Mary Anne Clarke, the duke’s mistress, which seems to have been an expected household position for many of the royals we have been reading about. Just being a mistress didn’t necessarily seem to carry the mark of scandal, but Clarke got in trouble for taking bribes from men and using her influence with the Duke to get these men commissions in the military. Clarke and the Duke went to trial, were convicted and she went to prison. He was exonerated, perhaps because he was a very good general, our guide suggested, who went on to reorganize the English army. She went to France, married a du Maurier and ended up as the subject of a book by her great-great-granddaughter, Daphne du Maurier, which I would be reading now if the museum shop had not been sold out of them. When Buck was 45, he married a 20-year-old woman. They had five children but only two survived to adulthood. By the time Buck died in 1833, his style had gone out of style and he left his widow in poverty, the wretch. Now you have heard of Adam Buck. 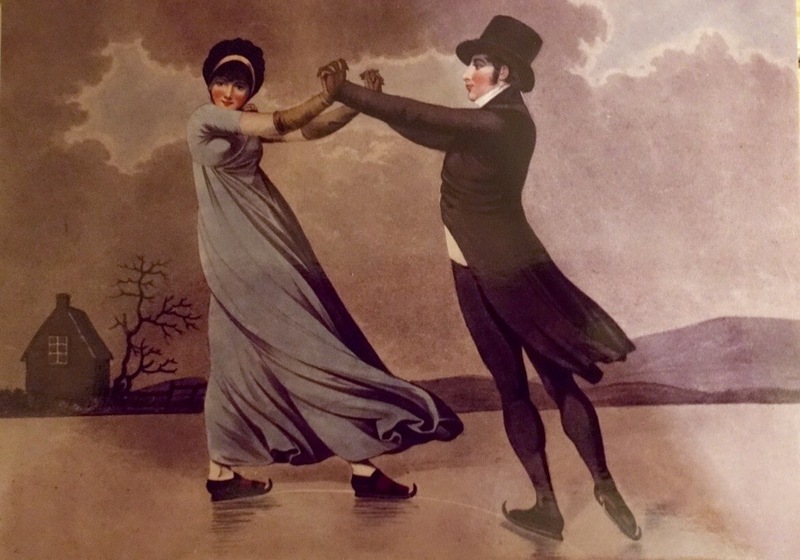 A print of skaters from a painting by Adam Buck. Posted on September 10, 2015 September 11, 2015 by jbsaulPosted in TravelTagged Adam Buck, Ashmolean Museum, du Maurier, Duke of York, Mary Anne Clark, Miniatures, Painting.